I started a series of tests with the UltraMic 384K of Dodotronic, a small microphone manufacturer founded by Ivano Pelicella based in Rome. Ivano is a biologist with a passion for electronics who designed this and other devices for listening to nature. The microphone is USB this means that it does not need external audio recorders but that can be attached directly to the computer or to a smartphone or tablet. You only need to get programs or applications suitable for receiving the digital stream that UltraMic produces. For further technical details, refer to the product page linked above. We must point out, the UltraMic is not to be considered a microphone as it is intended in the audio sector; it is more appropriate to think of it as an ultrasound sensor used for the study of communication in the animal kingdom. It is also used in the industrial sector to monitor the state of health of some machinery. 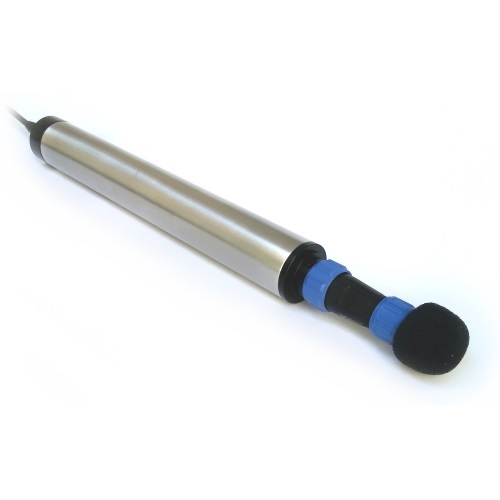 It can not be used as a studio or field recording microphone, because the output is not optimized for the audible band, the signal is a bit noisier and the resistance to sound pressure is lower than traditional microphones. How can it be useful then in the creation of sound effects? UltraMic records vibrations in the air up to 190Khz with sampling frequency at 384Khz and a resolution of 16 bits. The range goes well beyond the average limit of audio equipment which, with the exception of some cases, does not exceed 20Khz. Although very high frequency ultrasound sources are rare in nature (only a few bats and some cetaceans reach such frequencies), ultrasounds just above 20Khz, and up to 60Khz, are not so difficult to produce; the human voice itself generates frequencies that go beyond the limit of human perception. If you make recordings that capture in the signal even the ultrasound you can produce interesting timbres, in fact slowing down the speed and, consequently, by lowering the tone of the recorded sound you can bring in the audible band the captured frequencies that are over 20Khz. When this type of process is done on a normal recording, which has no ultrasonic information, the sound timbre tends to lose harmonic because, as it slows down, the high frequencies disappear making the sound unattractive. Having information recorded over the high frequency threshold allows the slowing down of the sound to be attained while still guaranteeing a particular timbre complexity. The use of this “traditional” technique has always been used to obtain the illusion of a greater dimension of the sound source. Having the possibility of extending it, without losing information on the high frequencies, generates many possibilities in the search for new sounds. You can listen very first raw tests that I have performed in the playlist below, I hope to be able to post more articulate in the future. Of course, the temptation to create the classic monster voices wins! It is therefore vocal recordings, recordings made with a balloon and finally a toy for newborns and metal rubbings made with a spatula. Some recordings are slowed down to -90% of the normal speed and still minimum of -60%. I put an EQ, a reverb and a compressor in the chain. In one case I used a modulated filter. I intentionally left the self-noise of the mic to get an idea and, in some moments, you hear a sort of ticking in the recording, those are ultrasound generated by some studio power supply that was around 160Khz, a rare case of ultrasound at very high frequency!